Jump Boots and Jumping Shoes can give you the advantage when you need to bounce a little higher. Contrary to what soe people may believe, all shoes are not created alike. The reason that there are so many different styles and types available is that each is designed and crafted to meet specific needs of the users. We're going to take a close look at what Jump Boots and Jumping shoes are, what makes them different and the advantages that they have to offer. In this review of the best jump boots and jump shoes you'll learn what to look for in order to get the best. we also have some of the top picks in review for your consideration. What are Jump Boots and Jumping Shoes? How many calories does kangoo jumps burn? Jump boots and jumping shoes are footwear that are specially designed and built to add a spring to your step and to help in protecting leg and foot tissues from injury. 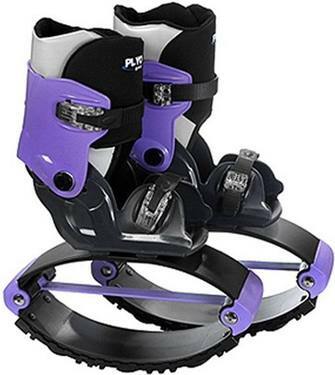 A single spring built into the bottom of Jump Boots and Jumping Shoes help in getting a real bounce to your step. The spring collapses and then rebounds for an effect that is similar to jumping on a trampoline. There are multiple advantages involved in the use of jumping shoes. They are fun for recreational use, but there are also health benefits that go along with them. The latest designs and improvements have made jumping shoes easy on leg and foot joints. They are also useful for people who are working on weight loss and muscle toning. Studies have shown that wearing jumping shoes increases the rate of calorie burn so you get the added benefits of losing weight more quickly. Jumping shoes provide a cushion that helps to protect your body from the jolting action that is caused when you run on asphalt, concrete and other hard surfaces. They act like a shock absorber and can make your exercize program go more smoothly with a greater level of comfort for your legs and feet. It takes a little effort to get used to wearing them so you should use caution when you first begin to use them. 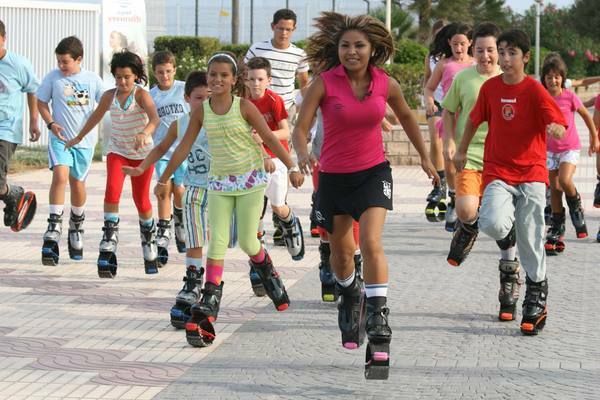 The weight limit of Kangoo Jumps is usually up to 200 lbs. 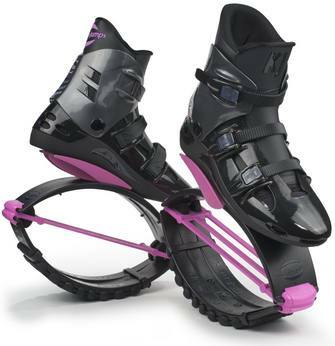 So, can you lose weight with kangoo jumps? Of course you can. Jumping shoes workout is very effective. We selected the best jumping shoe workout video for you. Enjoy. Jumping shoes are a great way to burn calories. You can burn around 267 calories by doing just 30 minutes of kangoo jumping. The recommended age for jumping shoes is 6 years and up. The price range for jumping shoes is usually from $100 to $260. You can check the latest price of most popular jump shoes here. Before you make your purchase, look for jumping shoes that are highly rated for quality, comfort, performance and design. Not all jumping shoes meet the same standards. The best jumping shoes will provide a good bouncing effect as well as offer protection from joint or other types of tissue damage. The best way to find the ideal jumping shoes is to consider consumer reviews. We have gathered a collection of the most highly rated products reviewed by consumers who have actually purchased, used and given their opinions on the value and usefulness of the shoes. This is one of the most reliable ways to learn about what is good and what is bad about a product. We've included complete descriptions of the shoes along with information about special features and pricing to help make it easy for you to find the best jumping shoes. Air Kicks Anti-Gravity Running Boots with energy burning design. Patented technology known as Jumping Jax makes use of T-spring construction crafted of heavy duty rubber for the transformation of downward energy. Stride becomes more low impact and longer for back, knee and ankle protection from injury while exercizing. Enhanced comfort with soft cushioned construction for smooth motion. The boots increase calorie burning processes for faster weight loss and a design that promotes safety while performing leg strengthening and muscle building workouts. Non marking treads protect delicate floors and a high traction design gives them good rating and safety for use on all surfaces. Air Kicks Anti-Gravity Running Boots fit over athletic shoes and the adjustable feature makes them compatible with any shoe size. One of the best features associated with this product is the adjustability. When purchased for children, they can be adjusted to fit them for several years as their feet continue to grow. The shoes perform very well as bouncy shoes and offer a greater degree of protection when performing fitness routines. There is a slight learning curve when first using them. People with mobility and balance issues may experience problems and caution should be used. Many reviewers give these bouncing shoes a thumbs up for easing strain on joints and muscles. They are therapeutic and help to improve existing joint conditions. Consumers give these jumping shoes a rating of 2.9 out of a possible 5 stars, which is well above average. Some users report that these bouncing shoes have a tendency to rub the ankles. The problem is solved by wearing thicker socks. Others were not pleased with the overall quality and durability for the price. The price range is between $149 to $386 making them a little expensive. Air Kicks Anti-Gravity Running Boots get good marks for providing ankle, leg and back protection while exercising. They offer fun and bouncy recreation for people of all ages. 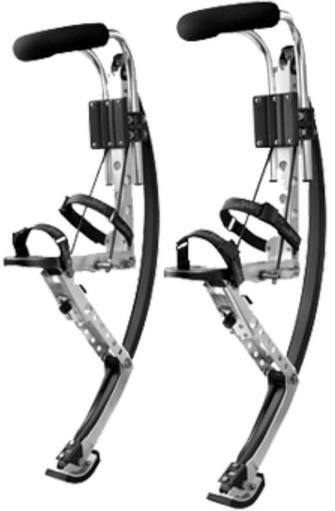 While there were a few complaints about materials tearing shortly after purchase and minor discomfort for some users with ankle rubbing, the majority of users were satisfied with this product and would recommend it to others as a fun and safe way of exercizing, toning muscles and burning excess calories. Improve health and fitness safety with Kangaroo Jumps rebound shoes. These Kangaroo boots offer protection from impact injury as you exercize your way to better health. Swiss design is designed to be used by people of all ages. They easily fit over any sneaker type for added safety when participating in plyometric training, rehabilitation therapy, aerobics, jogging, running, dancing, boxing, martial arts, boxing and other physical activities. Stiff build and design increased the resistance factor of cardio workouts, making them more effective. Feel the burn and reap the health beefits of increased stamina. Comfortable design for additional protection from imact injury without lessening the health benefits. The Kangaroo jumps make a noticeable difference when wearing them during a workout. They make cardio workouts easier for people with existing health problems, especially joint issues because the decrease the amount of impact. This makes exercizing less painful and more beneficial. Running and jogging time is cut down because the jump shoes help you to cover a longer distance in a lot less time. Some users report that the buckles are hard to snap closed. These bounce boots sometimes have an annoying squeak. They are slick on some surfaces so caution is advised when using the. Because they are so stiff, there is not as much bounce as was expected. The cost of $259 seems expensive for some, but others feel that the cost is reasonable for the benefits. Kangaroo Jumps get a very high consumer rating of 4.5 out of 5 stars. 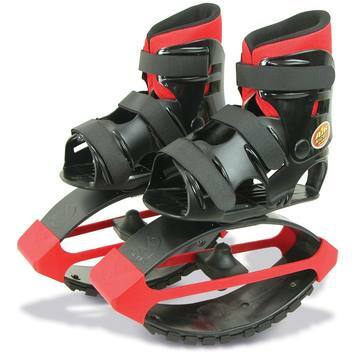 There were a few dissatisfied users who reported that they had issues with the buckles, lack of bounce, too much stiffness and not enough bounce. Some were also concerned about a lack of traction, but an overwhelming majority give it rave reviews for being a high quality product that delivers high on improving the effectiveness of workouts while being fun and adding a joint protection factor that they found to be beneficial. This product comes highly recommended by most who have tried it. Overall, these are the best jump boots for people who have existing joint or muscle conditions and want to protect them during physical activity. They are also the best bounce boots for anyone who wants to intensify the effectiveness of running, jogging or other cardio workouts. G-Max Shoes are gravity defying additions to your athletic shoes designed to increase calorie burn and build fitness. Unisex design works for peopel of all ages and genders. Enjoy low impact workouts while having fun in the rpocess. Built to enhance coordination and strengthen muscles in the legs. Gravity defying feature makes workouts more intense while lessening the impact on joints and other leg, back and foot tissue. The design incorporates a ball with a flexible spring as a device that absorbs shock, lessening the chances of sustaining an impact injury. Safety feature includes a reflector system located on the back side of these jumpy shoes for night time use. Ease of use is a hallmark feature because of the adjustable belt strap built into the shoe belt with a screw placed on the side of the Jumps. They provide a flexible and adjustable fit so they can be used with practically any athletic shoe. The G-Max Junior Jumping Shoes Boots for Kids are the best jumping shoes for kids. Adults who purchased them for their children give them a high 4.5 out of 5 rating for being of excellent quality, durable and safe. These jump shoes make exercizing fun so kids are anxious to engage in healthy activities. The cost of $115.99 is very reasonable making them an excellent value for the price. There were few disadvantages reported with the G-Max Junior Jumping Shoes Boots for Kids. One user commented that they are a little on the stiff side but this was not indicated as a problem. Overall, the reviews for the G-Max Junior Jumping Shoes Boots for Kids were excellent. They provide a fun format for kids to get the healthy exercise that they need and have a good time while they're wearing them. They are the best bouncing boots for young people because they not only encourage fitness, they offer protection from impact injury as well. This product is SGS and CE certified for passing rigid safety standard. This is an indication that these jump stilts are safe for play. The weight limits for load range is between 155 and 200 pounds. There is a learning curve associated with the use of the stilt format. Most users report that using these stilts are a lot of fun. They also make workouts a lot tougher so the health benefits are imense. The quality is very good and they are easy to put on. Wearing them is very tiring but this is a good thing because it means that they are working. Consumers give this product a 3.9 out of possible 5 star rating, which is well above average. Trampoline jumping boots are useful for making exercise a little more challenging yet beneficial to your health. They also create more fun while you're toning your body. The design of trampoline jumpng shoes adds protection from impact injuries because of the bouncy cushioning features. We've presented the four top bouncing shoes for your consideration. Which one is the best? This depends on your own needs and preferences. Each product that we've reviewed has its own particular set of pros and cons. By taking a glance at what others had to say about their experiences, you will be better able to find the bouncy shoes that will work the best for you. We hope that you find this review helpful for making it more convenient for you to find the ideal jumping boots for you or as gifts for your loved ones.